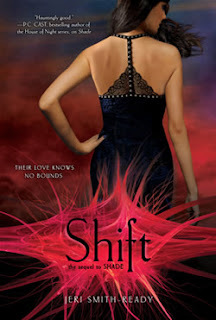 Jeri Smith-Ready: Happy Solstice/Birthday SHIFT ARC giveaway! If you've read Shade, you already know that it's Aura and Zachary's birthday*. So what better occasion to hold the first giveaway of a signed ARC of Shade's sequel, Shift (coming May 3)? 1) I can afford to make them international. Yay! 2) Each giveaway will be very special. One of the other 4 ARCs will go to a newsletter subscriber in a drawing I'll do probably around the middle of February. If you're not a subscriber, you can sign up in the box over on the right sidebar. The other two ARCs? Who knows? Stay tuned. 2. The name of the place Aura's mother traveled to before Aura was born (the specific place, not the country), a place integrally connected to the winter solstice. 3. The name of the haunted battleship that Aura and Zachary explore on their winter solstice/birthday "date." 3. Retail value of ARC = $0. Sentimental/bragging value of winning an ARC = that's up to you! 4. I'll send an e-mail to the winner Friday, December 24. The winner will have a week to respond with his or her mailing address. If no response has come by the end of 2010, I'll draw another name. And now, as a little holiday gift to Aura and Zachary, a pair of "classic" carols from Italy and Scotland. *To be completely clear, it was the same day but on separate continents with separate parents--they are not, I repeat NOT siblings. Ew. Just...ew.